Okay, close your eyes. You're in your house. Think about music. Think about where you listen to that music. Is it your headphones? But you're in your house, why isolate yourself even more... what if you have people over. It's got to be some speaker. Do you have some small portable BT speaker. Is your home theatre (who has those anymore? 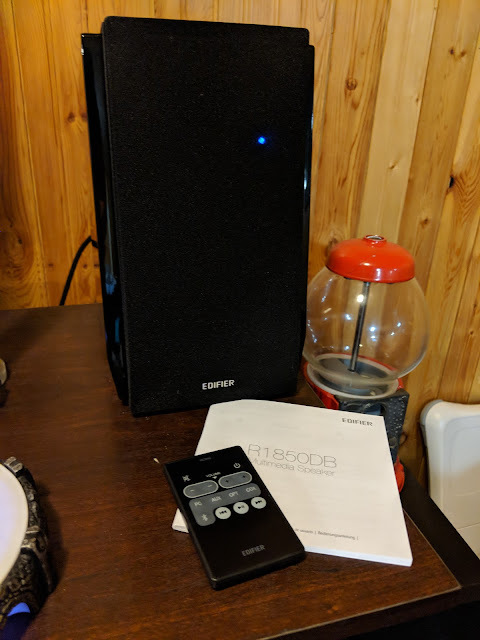 I just finally took mine out in exchange for soundbars)? But when I really want music, I want speakers. But nobody really has room for those big towers anymore. When I was young, rooms that had speakers, usually dens or mini-libraries, had these little bookshelf speakers. When I was at Sears, we did a fair trade in those little mini stereos with detachable speakers. But they looked so ... high tech. I recall when JVC went to a 'retro look' with wood grain boxes. Those flew off the shelves. I think there's an opportunity to return to those days. 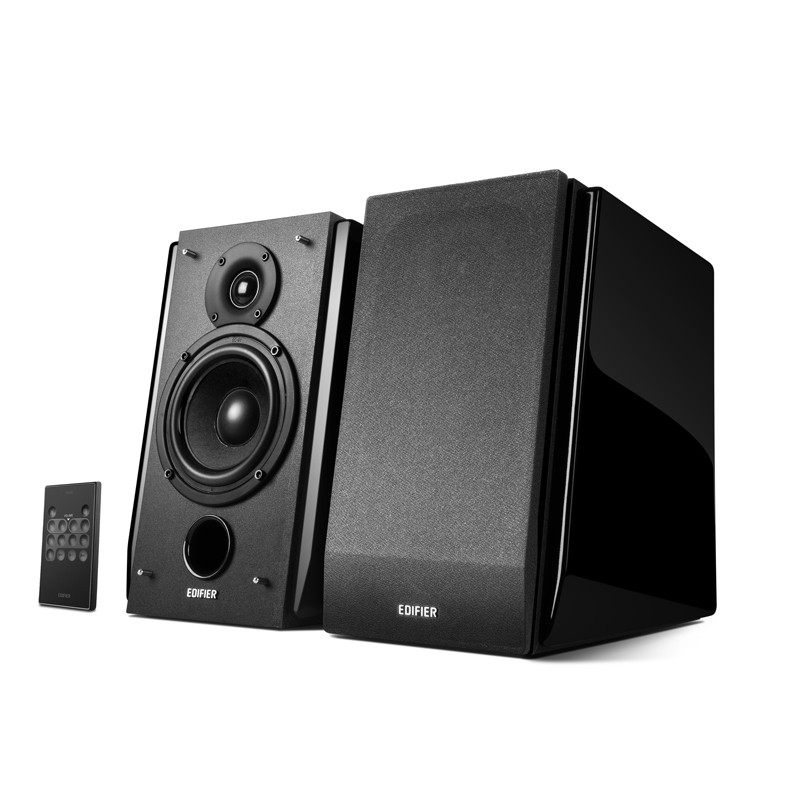 Thinking about speakers, the name Edifier isn't probably one you've heard of. It wasn't one I had, and I consider myself a recovering audiophile. But, they have a decent selection of speakers available, and they had sent along their one of their more "entry line speaker" - the R1850DB. That being said, it's still a $250CDN speaker. So that's a hefty price. But it's also a HEFTY speaker. That's usually my first indicator that there's more to it than just a box enclosure. The way this works is that unlike your normal tower or bookshelf speakers, it doesn't need an amp. So one less clunky thing. Instead, the amp is built into the units themselves. So it's a cleaner look. One speaker will have all the connections necessary. The 1850 has optical/coax (either or, not both at the same time), RCA (either as 'aux' or 'PC') and Bluetooth as methods to have sound come in. 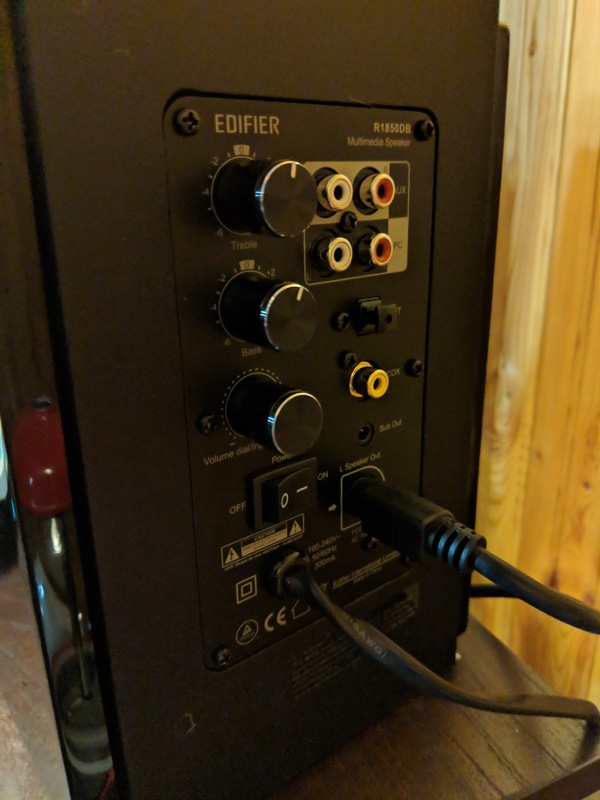 What's also neat is that it has SUB out, so if you're like me and pulled all your speakers out from your home theatre, but haven't gotten rid of the subwoofer yet, you can now use it. There's a speaker DIN(?) cord that connects the one speaker to the other. It has about 16ft there to play with. The volume controls are on the back and adjustments for the Bass/Treble are there. That's nice because unlike the Eneby you can see where the 'levels' are set versus just guessing. It even has a remote control ... the remote is a little thing ... but what I found weird was that it has two vol- buttons next to each other and two vol+ next two each other. Weird. Red - optical ... makes sense, red blinking 2x means coax. Green - PC ... blinking 2x means it's AUX. I guess then that it has 5 input options. SO keeping it straight might be a little hard. A simple LCD would have been handy, but I guess space is a premium. Connecting to Bluetooth via my phone was simple. At the outset it pairs simply. To pair another you have to hold the BT button on the remote to get it to blink and put itself in pairing mode. Controlling the volume on the device doesn't control the max volume of the speakers tho'. So you may have to play with what levels you're comfortable with (50% at phone, 50% at speaker to give you some room). Okay, all that aside, how does it sound? That's the BIG important piece. Great is the simple answer. It really fills the room. I had it upstairs in our living room and turned it down all the way and then a couple volume notches up and it was easily loud enough. Clean bass, crisp trebles. Great. It's got 2 speakers in there, one firing at 16W, the other at 19W ... so 35W a side it'll cleanly put out some nice sound. Turning the volume up more overpowered the room easily. Then I put it downstairs in the den next to the TV. 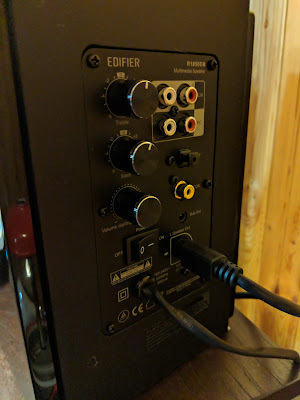 It was definitely a 'fuller' sound than the soundbar by comparison. Again, it filled that room (which is longer) easily. But I found that when I turned it up loud enough to really 'rock out' that as I would get closer to the speakers I found them a little muffled (I do like to turn up the treble) and not as clear. Adjusting the levels cleans it somewhat. But again, this is at some pretty near max levels of volume. Something I wouldn't often do. I had the family over for Thanksgiving, and when they weren't watching football down there, I had just soft pop music (pop rocks?) playing for background. I asked folks what they thought of the sound and all around no complaints. That's the proof of the pudding. If a bunch of folks can enjoy the sound without it being too much or too little and it's clean enough (there are a few audiophiles in my family) that a fault couldn't really be found. The heavy drivers and solid chassis/enclosure really makes for good resonance and sounds way better than my soundbars housed in metal / plastic cages. Or even shelf stereo for my computer using cheap MDF/plywood for its enclosures. Can't go wrong with these. The trick is it's hard to find them in a store to really compare with others. That being said, I don't think you'll be dissatisfied.